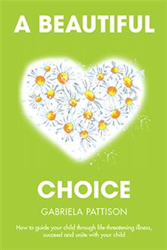 Gabriela Pattison marks her debut in the literary limelight with a parenting self-help book, “A Beautiful Choice” (published by Xlibris). This new publication offers parents and caregivers tools and resources on how to find answers on the most challenging journey through parenting – guiding children through life-threatening illnesses. “As a parent, when our child gets diagnosed with an illness, we turn to the child within us for help without realizing or recognizing it. What we are really trying to accomplish is to find answers to guide ourselves and our children through the journey of a life-threatening illness,” explains Pattison. “A Beautiful Choice” provides readers with the necessary recognitions, tools, and guidance to find the way during these challenging times. It compassionately shows the road through self-discovery, and starts to open readers’ mind to a new way of life. Kids don’t expect perfection or for us to know everything. They look to us for compassion and understanding that only comes from staying true to ourselves and admitting that we are not perfect, but we are here willing to make mistakes to figure out our new life. Validation is where love abides our being, creating an unyielding bond. Gabriela Pattison was born in the Czech Republic (former Czechoslovakia). She graduated as a pediatric nurse in 1995. In 1996, she moved to the U.S. in pursuit of her dreams to help families unite and break the patterns in parenting. She has spent the last 20 years researching the relationship between parent and child. In 2011, she expanded her research by learning how to parent a child during a life-threatening illness due to her 3 ½-year-old son getting diagnosed with leukemia. Today Pattison lives in the Chicagoland area. She coaches families, works on her book series, and teaches classes for parents and children. She is working on expanding her life’s dream by creating a franchise that will empower families in challenging times. Xlibris Publishing, an Author Solutions imprint, is a self-publishing services provider created in 1997 by authors, for authors. By focusing on the needs of creative writers and artists and adopting the latest print-on-demand publishing technology and strategies, we provide expert publishing services with direct and personal access to quality publication in hardcover, trade paperback, custom leather-bound and full-color formats. To date, Xlibris has helped to publish more than 60,000 titles. For more information, visit xlibris.com or call 1-888-795-4274 to receive a free publishing guide. Follow us @XlibrisPub on Twitter for the latest news.